If you want to captivate your audience, and keep them in the palm of your hand, then you might want to add magic. As well as being a master magician, Liam is also an accomplished emcee. Combining his skills has seen him praised for hosting events ranging from large, serious corporate conferences to more intimate professional gatherings and presenting at TEDx UNSW. Whatever your event, punctuating set piece presentations with carefully choreographed, up-beat and entertaining pieces will hold and delight your audience all night long. 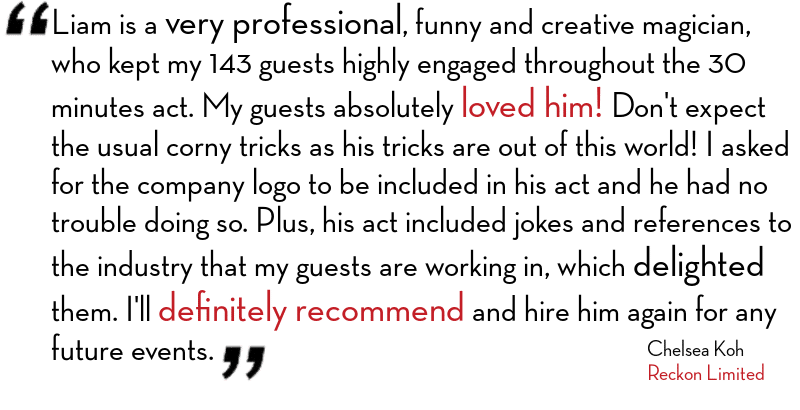 Liam will work with you to create the right blend of magic that suits your event.